Gunung Mekongga is the highest mountain in Southeast Sulawesi and one of Sulawesi’s most interesting, with beautiful limestone karst at the summit. It is a long trail, requiring a minimum of 5 days, and the trailhead is close to sea level. The trail leads into the hills from Tinukari, following a largely eastern direction as far as Pos 6 where it then heads south-east and then south to the true summit. Western and Indonesian scientific researchers have made trips here in the past and discovered new species. The recommended itinerary is as follows for fit and experienced hikers…. Day 1 – Pomalaa Airport to Pos 2. Total trekking time approximately 3 hours. If you catch the first morning flight from Makassar to Pomalaa (Kolaka’s local airport) and have a driver and guide ready for you, and have arranged permission to hike in advance, it is possible to reach Pos 2 the same day. From the airport to Tinukari takes about 3 and a half hours by car. You will have to register and speak with the Kepala Desa before starting your hike and may even have to drive to a police station to register too. From Tinukari (50m above sea level) to Pos 1 (185m) takes nearly 2 hours as you have to cross 15-metre wide rivers 4 times, wade upstream and scramble over slippery river cliffs and rocks. The river crossings can be difficult after heavy rain and are usually at least waist-deep meaning you will have to carry your bags above your head or, better still, ask a local to help you. Pak Jummarin is a friendly farmer who lives at Pos 1 with his family, surrounded by cocoa plantations and daun kelor – one of the healthiest leaves in the world due to all the vitamins it is full of. Your guides may well want to stop here for a while either on the way up or back down, especially if Pak Jummarin has fresh shrimps to eat. His son, Igo, may well be able to help you with river crossings on your way back down, or even on the way up if your guide can contact him in advance. There is space for a few people to sleep in the simple wooden house at Pos 1 if required, but not as much space as at Pos 2. From Pos 1 to Pos 2 (390m) takes another hour. You will probably see and hear many hornbills in this area. The wooden house at Pos 2 is quite large, with enough space for perhaps 20 hikers to sleep without having to set up tents. There is even a generator and a karaoke sound system! It belongs to Pak Basir, another friendly farmer accustomed to having hikers stay at the beginning or end of their journey. Day 2 – Pos 2 to Pos 5. Total trekking time approximately 7 hours. From Pos 2 as far as Pos 5 you are likely to meet numerous leeches so use leech socks if you have any available. There seem to be two different types of leech – a regular-sized, almost attractive speckled leech and a tiny leech that can go un-noticed and therefore be more problematic. Make sure you check regularly for them! Much of the trail is along an old logging road made by HBI, although they stoppoed operations in 1996 and so the road is very much overgrown with shrubs and unless hikers have been recently you may need to cut back some branches from time to time. Look out for orchids and pitcher plants. It takes about 2 hours to reach Pos 3 (680m). There is no hut here and not even much room for camping. Another 1.5 hours and you will be at Camp LIPI (930m) which is where researchers from the Indonesian Institute of Sciences and California’s Davis University camped during an expedition in 2010. Another hour and you will be at the NKRI Monument (1,055m), a grand model of the island of Sulawesi that was erected in 2013 during an expedition to the summit involving many different local and national organizations. There is plenty of space to sit here on the grass and have a snack, but flies seem to arrive in swarms in no time. Just 10 or 15 minutes beyond the NKRI Monument is Pos 4 (1,120m). A further two hours and you will be at Pos 5 (1,440m) but just before Pos 5 you will have to negotiate some slippery rocks and areas prone to minor landslides. Watch out for deep holes and drops on the side of the trail. Pos 5 itself is very pleasant and there is enough space for about 6 tents. There is also a stream next to the trail and the water quality is good. Remember that this is the last reliable source of good quality water so please fill up your bottles. However, for drinking water you should probably still use iodine tablets to be on the safe side. There is also plenty of ‘toilet space’ in the forest down to the right. Note that Pos 5 is also known as Pos Poya Poya or Pos Foya Foya. Day 3 – Pos 5 to Puncak Salah or Pos 8. Total trekking time approximately 6 hours to Puncak Salah or 8 hours to Pos 8. 30 minutes beyond Pos 5 you will see some old metal cogs or machinery pieces of some sort next to the trail (1,680m) which are remnants of the logging company machines. The path seems to change direction here and the walking is easy on firm ground. From here it is another hour to a very good viewpoint known as HBI Peak or Puncak Indonesia Raya (1,870m). In good weather the views over the forest below are excellent. Another 30 minutes and you will be at Pos 6 (1,880m) which is next to Coca-cola Lake – certainly a source of brown water (hence the name) for emergency use but it is stagnant so best used with caution. The swamp itself is rather picturesque and there is enough space for 4 or 5 tents here at Pos 6. From this point on you are likely to see lots of anoa dung. These fascinating highland cattle are quite common on the higher slopes of Mekongga but they are difficult to see because they run away as soon as they hear humans. However, they can be aggressive – for example if they are protecting their young. 20 minutes beyond Pos 6 is a spot suitable for an early lunch break (1,940m) although you may prefer to wait until Pos 7 (2,345m). Between Pos 6 and 7 you enter beautiful moss forest – the anoa’s domain. Total time from Pos 6 to Pos 7 is about 2 hours. Pos 7 itself is a lovely spot – a ‘batu meriam’ (stone cannon) supposedly alligned with Mecca, and various interesting limestone karst rock formations. From the stone cannon you can see some distant, jagged cliffs higher up the mountain. Beyond Pos 7, the terrain becomes more challenging, with sharp, slippery rocks and steep little sections seemingly every 15 minutes or so. It is, however, the most beautiful part of the whole trek and quite unique in Indonesia (although East Timor’s Matebean Mane is not dissimilar). Another hour after Pos 7 and you will be at Puncak Salah (‘false peak’, 2,515m) – a lovely karst outcrop that is like a much smaller version of the true peak. Take care, especially if carrying a large backpack. The views here are very pleasant but you soon re-enter forest. This section is the most confusing of the whole trek because there are various ribbons leading in various different directions and it is unclear which one is the main path and which is to a potential water source. There is definitely a source of water about 10 minutes down to the right of the main trail, but you would need an expert guide to locate it. About 300 metres beyond Puncak Salah on the correct trail to the summit is a small opening (2,565m) large enough for 4 or 5 tents, although it is not especially flat due to tree roots. Given that Pos 8 is another 90 minutes through challenging terrain, you may decide to camp here instead of carry your equipment all that way to only have to carry it back again the following day. If not, take real care as you descend and reascend numerous times before reaching Pos 8 (2,520m) which is at the foot of the summit mound – about 30 minutes before the top – and has enough space for 3 or 4 tents. You will probably see a couple of simple plaques to the hikers who died here in March 2017. Day 4 – Onward to the summit and back down to Pos 5. 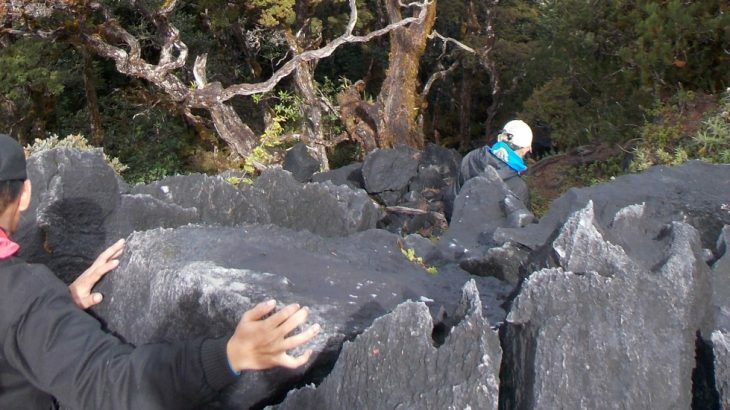 Total trekking time approximately 8-9 hours from Puncak Salah or 7 hours from Pos 8. As usual in Indonesia, the best time for clear weather at the tops of mountains in first thing in the morning, so it makes sense to aim to be at the summit as soon after first light as possible. This is easy if you spent the previous night at Pos 8 as it is only 30 minutes further, but if you were camping near Puncak Salah then you need 2 hours to reach the peak and it is not recommended to do so in the dark as the terrain is difficult enough in daylight! You will certainly need to use all four limbs in several places. between Pos 8 and the summit is even harder – very steep terrain and finally a large area of sharp karst rocks with deep crevasses between them – use gloves for this section if you have them with you. The summit is crowned with a cement pillar created during the NKRI expedition in 2013 and there are a couple of other markers. The views are superb in good weather – the foreground of jagged karst rock formations with cloud swirling around distant hills and the coastline beyond. The summit is also known as Puncak Mosero-sero. After enjoying the views it will take about 2 hours back to Puncak Salah and a further 4 or 5 hours back to Pos 5. Day 5 – Back down from Pos 5 to Tinukari. Total trekking time approximately 8-10 hours. It is a long day trudging back down to the trailhead from Pos 5 and because you will be feeling tired after several days in the mountains you need to take extra special care when doing the river crossings. For those who are exhausted or if the river is raging, you may need to spend an extra night at either Pos 1 or 2. Hopefully your driver will be waiting to take you back to Kolaka in the evening. Getting there: Pomalaa is the nearest airport – less than one hour by car from Kolaka. There are daily flights from Makassar. From Kolaka to Tinukari trailhead is 2 hours and 30 minutes. You can also fly to Kendari, the provincial capital, which is about 4 hours from Kolaka. Accommodation: Numerous hotels in Kolaka. Permits: Try to arrange this with your guide in advance. You need to register with the Kepala Desa at Tinukari but if you are non-Indonesian you may also need to register at a police station some distance away. Much better to try to arrange in advance by email if possible as it can be time-consuming. Water sources: Plenty of streams as far as Pos 5 (1,440m). Limited, poor quality sources higher up such as the ‘Cocacola Lake’ at Pos 6 (1,880m) and a place down to the right of the trail just beyond Puncak Salah (2,515m). Featured, Sulawesi Tenggara Tinggi Sedang. permalink. Mekongga is a really special trek – particularly the summit area which is an expanse of jagged limestone karst. Perhaps only 100 hikers do this trek each year, and many of those for 17th Aug Independence celebrations – indeed there were about 30 hikers at the summit when we were there, which might be the most Mekongga has ever seen at the top in one day. Coincidentally a group of French hikers had planned a hike up Mekongga for the same week as me, so Tim Inggris and Tim Prancis more-or-less joined up for much of the 5 days needed to ascend and descend. I am very glad of this, as not only is it really important to have good conversation during a multi-day expedition of this sort in order to keep morale high whatever the weather, but also because they brought with them several jars of Pesto and several kilograms of pasta!!! As Mathis joked, we may have been the only group ever to have put on weight during a trek to Mekongga! Needless to say, you need to be in good shape to handle 5 days of arduous trekking. It is a long way, and many local hikers do not reach the top but rather turn back at Pos 6 or so. Slower hikers might need 7 or 8 days to complete the trek – which means more food required….. There are two main organizations in Kolaka who can guide you – the French team were helped by Mapala USN and I was helped by Wawan and Bondan of Citaka (wawancitaka@gmail.com / 0851 4511 1234). Both groups know the mountain and each other well. Other than taking enough food and having an experienced guide lead you, the other crucial thing is to try to arrange permission in advance. Unfortunately, foreigners are discriminated against with regard to hiking Mekongga. Whereas any Indonesian can hike without having to report to police offices and so on, foreigners are supposed to report at a local police station and the process is unclear and time-consuming. The French team were sent to one police office, who then said they had to visit another, presumably more senior, some distance away. An attempt was also made to dissuade them from climbing by listing all the more accessible ‘tourism objects’ in the region such as beaches and so on. The distance between the trailhead and the relevant police office meant that they were delayed by over 4 hours on Day 1 of their hike. As I was starting the same day and was in regular contact with the French team, we basically told the Kepala Desa we were with the French team, to avoid having to dash here and there and ask for permission to hike and waste half a day on bureaucratic matters (including posing for the obligatory facebook photos of a white person) and be told that hiking is dangerous and so on. This initially seemed to have worked out nicely as I promised to give the Kepala Desa a photocopy of my passport upon return after the hike, although when we did indeed get back after a very tough final day all the way down from Pos 5, he was perplexed that the French team would be not be down until the next morning and to smooth things over he insisted I attend a local wedding party in the village when all I wanted to do was give my feet a well-deserved rest in Kolaka! It was a bit much, to be honest. If possible, try to arrange this is advance if you do not have too much extra time to waste. The local concern is understandable as two local hikers died earlier this year on Mekongga (though how many pedestrians are killed each year simply trying to cross the road in Jakarta?). However, when at the summit I met an Indonesian hiker who had taken his 3-year old girl up with him. I very much doubt he had to ask for permission at numerous offices, yet experienced non-Indonesian hikers with experienced local guides are indeed supposed to jump through these time-consuming hoops. Be aware if you happen to be non-Indonesian! The toughest part of the hike is probably at the very beginning/end – the 4 river crossings of which 3 and 4 (on the way up) seem to be the trickiest. It was ok on the way up but coming back down on day 5 the river was deeper and much more fast-moving, plus daylight was fading fast. There are also sections where you need to negotiate slippery river cliffs. Thanfully a very nice young student called Igo accompanied us and helped us with bags. Having relatives at Pos 1 and also in the village of Tinukari itself he is an expert at crossing the river. I would advise getting a local local to assist in addition to your Kolaka guides, especially if the river level is higher than normal. After we had got through the river section, which is quite a grand entrance indeed, Wawan told me that the mountain knows when someone new enters the area. The French team had been told of supernatural forces by the Kepala Desa and were advised to simply ignore anything odd and simply continue as normal. Whilst I didn’t notice anything unusual of this nature during the 5 days (other than local porters using sanitary pads as shoulder pads! ), my phone behaved very strangely indeed, refusing to recognize my local SIM card, as if Mekongga itself was in a different zone altogether….. This was my itinerary…essentially 4 and a half days of hiking, which is probably as fast as you can sensibly do it. I would allow at least one spare day at the end for if the river is high or if you are delayed for whatever reason. Day 1 – Makassar to Pomalaa flight. To Kolaka. Get supplies, meet guides, head to Tinukari. Stay at Pos 2. Day 2 – Pos 2 to Pos 5. Day 3 – Pos 5 to Pos between 7 and 8. Day 4 – Pos between 7 and 8 to summit and back down to Pos 5. Day 5 – Pos 5 to Tinukari and back to Kolaka in the late evening. The mountain sees a lot of rainfall…. 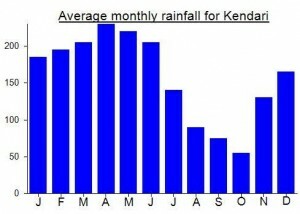 apparently October/November is the driest time and therefore perhaps the best time to choose for your trip if you can. On the road out to Tinukari from Kolaka, I spotted an official road-side sign that used the exact same phrase a sign in Java used that was covered recently in a blog posting by Elizabeth Pisani. ‘Dilarang Kecelakan Disini Karena Rumah Sakit Jauh’ – which roughly translates to ‘It is forbidden to have accidents here because the hospital is far away’!!! What kind of logic is that? It would be comical if it weren’t an official poster! Who on earth deliberately wants to have an accident and decides whether or not to have an accident in a particular place based on how far or distant the local hospital is? Ridiculous! Costs…… the taxi price from Pomalaa airport into Kolaka town is Rp250,000 – quite expensive for a journey of less than one hour, especially if you are travelling alone. The only 4 star hotel in town – Sutan Raja – will quote even more… Rp300,000. Therefore it is better to hire a car and driver to pick you up at the airport and back into town for supplies and meeting your guide and then on to Tinukari for the trek. This is about Rp600,000 for the full day. For just being taken to Tinukari from Kolaka it is Rp550,000 for a 2 and a half hour trip. Alas, my driver was late meeting me at the airport (or simply couldn’t find me) and there was a funfair of some sort on the same morning meaning hundreds of local people at the airport. I was mobbed by adults and children alike with selfie sticks and it reached a point where I had to retreat into the Ruang Informasi (information room). The women in the Ruang Informasi wanted selfies too, but at least there were only 4 of them as opposed to 400!!!! As you might have gathered, Kolaka does not see many foreign tourists. Beer is expensive and only found in karaoke places (Rp73,000 a bottle) or the Sutan Raja hotel (Rp70,000) so best take a few cans with you from the impressively well-stocked Makassar Airport! On the way back to Jakarta, as I had to transit at Makassar anyway, I decided to visit the Maros caves (Leang Leang). At Leang Pettakare you can see a painting of a hog deer and various hand outline prints that are apparently at least 7,000 years old. The oldest human art in the world (40,000 years old!) is also to be found in this area – but that particular cave is closed to the general public. Only Rp100,000 by Go Car from Makassar airport (just under an hour) – but you will need an ojek or public transport to get back again. The rock at Maros caves is very similar to that found at the summit of Mekongga….. jagged limestone karst…..